In concluding Dinosaurs, diamonds and democracy (2009), his pocket history of South Africa, the economist, Francis Wilson, reports a reputed prime ministerial observation by Jan Smuts. During the 1930s, he considered the haemorrhaging of the country's topsoil to be the country's gravest issue, far more important than its political problems. There, unlike as with his cranky scientific and philosophical theories, such as holism, Smuts may well have been on to something. Wilson stresses the extent to which environmental degradation is sure to dominate South Africa's future. In The rise of conservation in South Africa, William Beinart underlines its importance in the past. Recently re-issued in paperback, this major study by the Rhodes Professor of Race Relations at Oxford University is more about grass and grazing than ethnicity. Still, in that respect, it may owe something to Smuts who, incidentally, gets three listings in the index. Drawing on a vast range of sources, in what looks to become a classic of South African environmental history, this book's analytical focus is on the pastoral past, examining, mostly, the Cape midlands livestock farming districts of the semi-arid Karoo and the adjacent, less arid, eastern Cape grasslands. Once populated lightly by roaming Khoisan and by sturdier African chiefdoms, colonial conquest eventually displaced pre-colonial landholders. By the mid-19th century, these farming districts had become occupied by dominant White settlers. As the midlands were too arid for large-scale commercial crop cultivation, the wetter eastern pastures became an increasingly intensive pastoral domain, stocked by masses of sheep as well as cattle. It did not take long for the cash registers to start ringing. From around 1830 to 1950, the Cape resembled Australia in this regard. 'Pastoral production and wool exports', the author notes, were 'a major motor of the Cape economy'. Alongside the benefits of bleating beasts, those which lowed were no less tuneful, as cattle became essential to domestic life, to transport and to internal markets. But it was not all some endless Eden. Systematic exploitation of livestock was dependent, almost entirely, on the health of natural pastures, or the veldt. And, as this book reveals, almost from the beginnings of White commercial pastoralism, the more sharp-eyed farmers and agricultural officials were spotting the damaging ways in which livestock usage was not only eroding soil and degrading the veldt, but also hurting animals. Thus, critics of the night-time enclosure or kraaling of sheep and cattle (to secure them from predators and theft) argued that confinement fostered the spread of contagious disease. In the 1870s, one specialist observed that 'the daily trek to and from pastures [that] weakened sheep and destroyed vegetation around the farmhouse and along the routes' was even worse for the environment. By the early decades of the last century, the sound of such alarm bells had become deafening. To their staple worries about wildlife protection, South African conservationists added mounting concerns over pasture deterioration, overstocking, soil erosion, diminishing water supplies and other kinds of environmental blight. This chorus of conservationist anxieties and remedial ideas provided the basis for a reforming of farming practices and extensive state intervention, aimed at conserving natural resources and at regulating the agrarian environment. This blanketed not only White English and Afrikaner farmers, but also African pastoralists of the Ciskei and Transkei, who were to be visited by agricultural 'betterment'. One of the most telling contributions of The rise of conservation in South Africa, is its salience for the current crisis of the country's environmental conditions, with damning national press reports, early in 2010, on how speculative mining exploration is polluting water supplies and poisoning arable lands. Given its essential 'Cape story', the environmental impact of mining naturally gets short shrift in his volume. Yet, in other respects, as Beinart's research shows, the general point still holds. After all, in the touchy relationship between ideas of national economic efficiency and conservationist beliefs, has it not been ever thus? In the early 20th century, fears that the exhaustion of mineral wealth would leave only agricultural resources made 'water conservation for agriculture' a national issue. Like any environmental historian worth their salt, William Beinart concludes on the more recent past and the future. On this, he is no silly utopian. His book's level-headed - if obvious - conclusion is that there is no prospect of recovering a pure natural environment unless all farming is abandoned. Nor, in any event, can all change be termed 'degradation'. For disturbance is a condition of human survival and nature is not 'in itself static'. What is needed, therefore, is an understanding of how the environment is opened up by a range of elements, including scientific and cultural forces, and of how to manage the unavoidable dilemma of balancing useful environmental transformation and actual degradation. That, summarised baldly, is the conceptual husk of this thorough and careful study. Its richness consists primarily of a detailed assessment of the effects of environmental ideas, policies and practices through successive eras of Cape history. In that respect, this is really a study of the rise of conservation in the Cape, rather than in South Africa. It still makes for a fairly sprawling book that manages to include both broad historical themes and highly specialised detail. Typically, a chapter on the interaction between drought, state conservation initiatives and nationalist ideologies in the 1920s provides a fresh perspective on a familiar past era. On the other hand, in the dense documentation of jackals and prickly pears, it may be more a case of, 'if you are fascinated by this sort of thing, then this is the sort of thing by which you will be fascinated'. Still, particularly for this journal's readership, The rise of conservation in South Africa has plenty of informational nuggets on how botanical, biological and other forms of scientific knowledge came to inform environmental understandings and the intellectual world of rural, White society. In that sense, it also contributes to the history of science in South Africa. Most evocative of all, is the contribution of the feverishly self-improving White middle classes who people these pages. Those were the zealous, mainly English-speaking, progressive capitalist farmers, wealthy landowning politicians and officials who grasped the nettle - or perhaps the wattle - of environmental regulation and disease control. Their impulses to stabilise and to control could be seen in a multitude of ecological actions, from the destruction of vermin and alien weeds, to water reclamation and fencing. 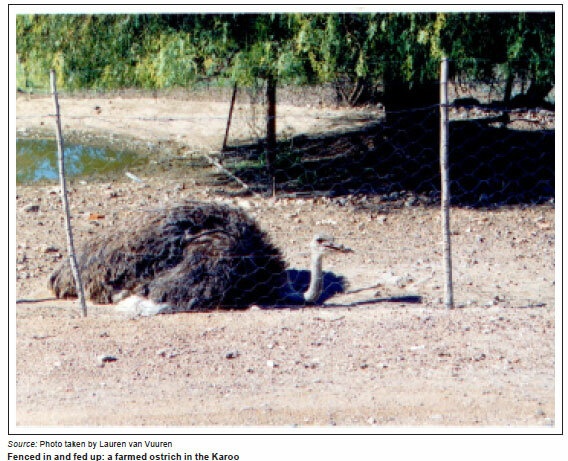 This did not remain a matter solely for White Karoo farmers. As this work's larger context reflects, the mental landscape of environmental awareness has no borders. It did not take long for conservationist preoccupations to animate government officials to intervene in African reserve areas, in an attempt to combat soil erosion and to regulate their bony livestock holdings. Predictably, few agriculturalists there embraced heavy-handed rehabilitation with enthusiasm. Ultimately, what does come across well throughout this study, is not merely the intricacies of the conservationist project, but also its uncertain outcomes and the ways in which it was frustrated and resisted by the more marginal rural inhabitants. 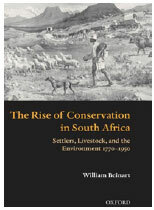 Meticulously-researched, restrained and earnest, William Beinart's work in environmental history gives us a sense of the land, of its productive place in a part of South Africa, and of large responsibilities.